I think entertaining should be carefree, not stressful! But when you are rushing around cleaning and thinking about food, who has time for creating fancy table decorations? So when you are in a hurry, but still want something cute and memorable for the table, here is one of my go-to simple ideas that can be put together in minutes, even at the LAST MINUTE! 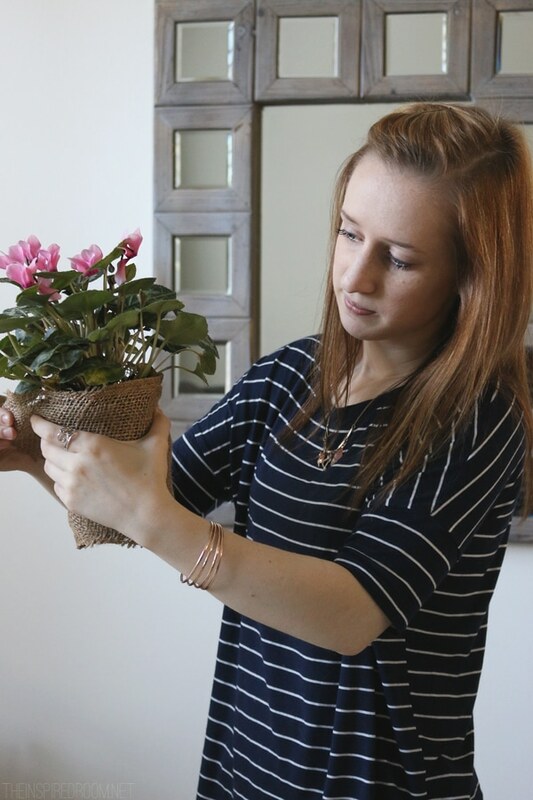 A bouquet can be a sweet centerpiece, but to be a little different I sometimes like to pick up some potted plants at a grocery store or local nursery to use as a centerpiece on the dining table or buffet table. They are economical, too. They last for a long time and can be planted outdoors when you are done entertaining! 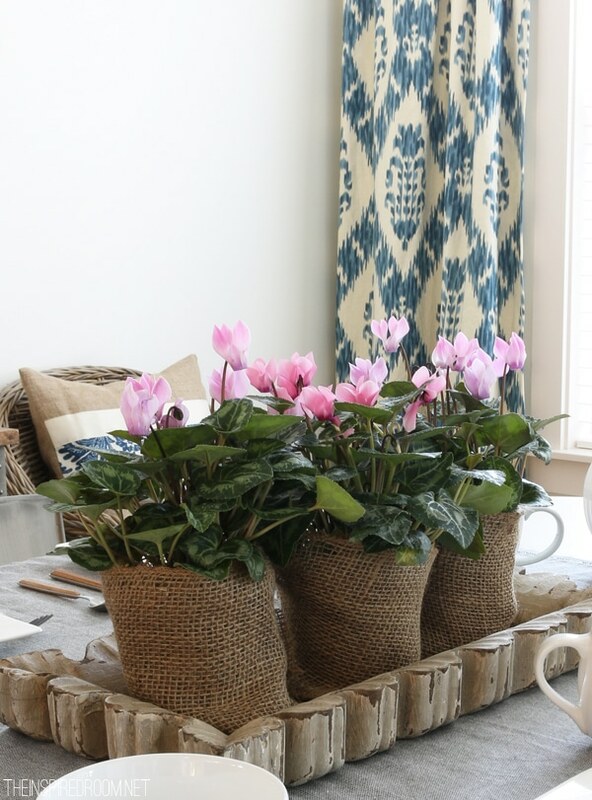 To give those plastic pots a finished look, no need to invest in prettier pots. 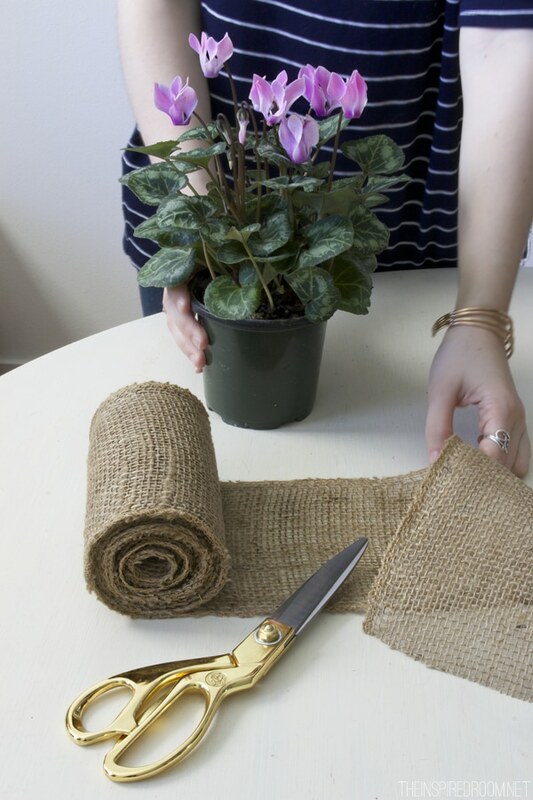 Keep a keep a roll of burlap fabric on hand for prettifing the plastic pot your plant came in (I found mine at Jo-Ann). No one needs to know your secret! I just cut the fabric, wrap it around the pot and tuck the ends in. Simple as that! 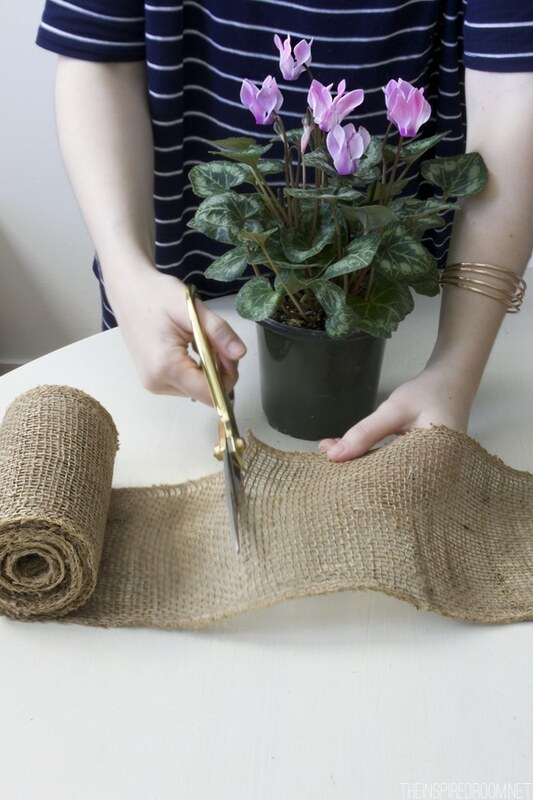 If you want to be even fancier or further secure the burlap, tie a ribbon or twine to the finished pot. I think using three pots on a longer table increases the impact of this centerpiece, place them on a short tray to add extra dimension. 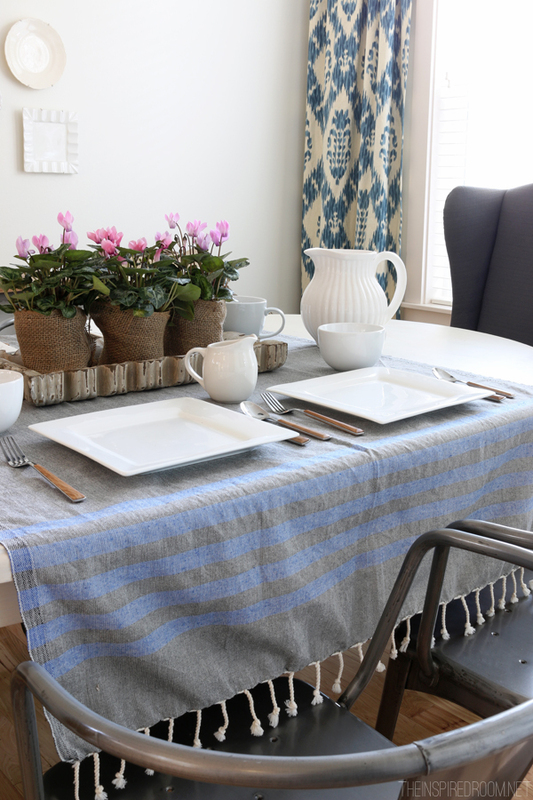 Plants make a thoughtful housewarming, hostess or just-because gift, too! Make these little pots anytime, them up with a bow and make someone’s day. Easy peasy and oh-so-cute too. 1) Do What You Enjoy. You’re the party-planner, so you have the power to design a gathering that you will enjoy, even during the planning and preparation phase. That means you can make decisions for an event that will be as simple or as elaborate as you want. If the idea of making cupcakes from scratch stresses you out, don’t hesitate to cut some corners and buy them pre-made! If you are all about the food but feel stumped when it comes to setting a festive table, find a few simple go-to ideas and feel free fall back on them time and time again. 2) Cut Yourself Some Slack! Make a plan, but keep it flexible! Parties can be unpredictable and things may not always go according to plan, but as long as you laugh off any mishaps and enjoy the experience, your guests will have a great time too. 3) Don’t Worry, Be Happy. Are you a worrier when it comes to bringing guests into your home? Chances are, your guests will simply be grateful that you are hosting them and will likely overlook any of the things you’re concerned about. Make a list of what worries you the most and address those concerns first with easy solutions so you can stop worrying and enjoy the rest of the experience. 4) Be A Gracious Hostess. The purpose of gatherings is to spend intentional time together and get to know your guests. If you are genuinely gracious and kind to everyone who enters your home, your party will be a success even if the dinner burns or you forgot to turn on your dishwasher before guests arrive. Kindness wins. Tag-teaming party planning and hostessing allows you to divide the responsibilities and reduces stress for everyone. Plus, it’s more fun!